Well, you get some of this information drip fed throughout this first issue, with the use of cuts between the present and recent past, but Nola does not wake up in a hospital. 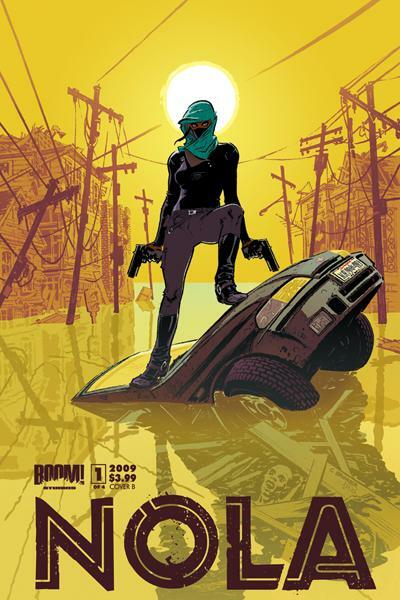 The first pages begin with a showdown between a masked woman and 2 police officers in what might appear to be a post-apocalyptic scenario. We later learn that this is New Orleans, post-Hurricane Katrina, and the post-apocalyptic mood to the piece is justified. This stand-off between Police and the solitary woman is continued later on in, ending in a way that is both shocking and unexpected, but before that we have some backstory on Nola Thomas and her life in New Orleans. It is her life prior to Katrina that gives this story depth and warmth to the otherwise brutal and sparse beginning and ending of Nola #1. We know that Nola has a close relationship with her Mother (and her Mother has the best line – something about wheelchairs and geriatric shenanigans that was delivered with sly wit and made me chuckle). Nola is having an affair with a married man, and that relationship seems destined for heartache – but actually turns into something darker and is the catalyst for Nola’s shocking transformation. To say more about the plot would ruin a great debut issue – it has some great elements that make me want to read the next installment, the art delivers appropriately and the dialogue is smart and believable. I like it. I think it has the makings of a great series. One to watch…. Nola #1 is out tomorrow (18th November) from Boom!